Nokia is still in smartphone business and this time they are coming with first Android phone by Nokia. 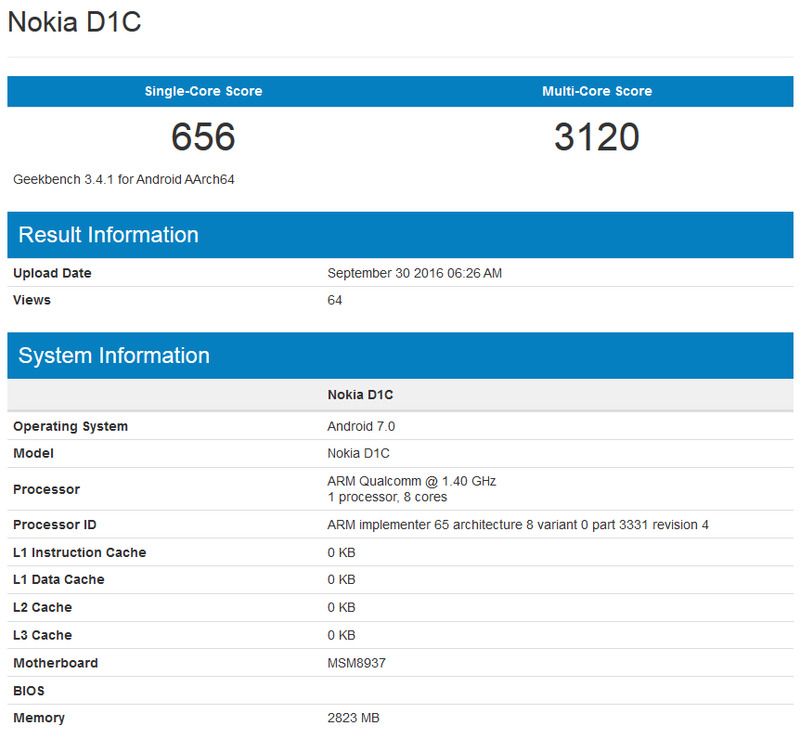 Nokia smartphone with the model number D1C has appeared on the Geekbench benchmark site. Not much is known about the device except that it is powered by the Snapdragon 430 SoC featuring an octa-core 1.4GHz CPU, and the Adreno 505 GPU. 3GB of RAM is inside and Android 7.0 is pre-installed on what appears to be a low to mid-range model. When the deal between Microsoft and Nokia closed in April 2014 sending Nokia Devices and Services to Redmond for more than $7 billion, a non-compete clause prevented Nokia from using its name on a new phone until today. You see, today happens to mark the beginning of the fourth quarter of 2016. We could see three to four new Android phones or tablets from Nokia during the current three month period that ends in December. Two of the handsets are rumored to be powered by the high-end Snapdragon 820 chipset. As we already pointed out, the phone spotted on Geekbench is a little more downscale than those two rumored models. With the Snapdragon 430 chipset inside, the Nokia D1C was run through Geekbench five times yesterday. The highest single-core score was 682 (twice) while the highest multi-core score was 3229.